Master darkroom printers have always been the unsung heroes of traditional silver-based photography, using their skills to interpret and enhance the photographers negative and produce a print that is a work of art in its own right. Now, as Tim Daly shows, a parallel set of skills can be used to produce prints of the same exceptional quality from digital or scanned images, using equipment that is readily available and affordable on the High Street. Tim Daly takes the RAW digital file as his starting point and explains the wide range of techniques that can be used to create the best possible version of the latent image. By following the detailed step-by step explanations, the reader will learn how to develop a personalized printing style using Photoshop, Lightroom and professional output. Driven by a photographic aesthetic, rather than an enthusiasm for software for softwares sake, the book shows how to deliver eye-catching prints in a wide range of styles. Illustrated with the authors own stunning photographs, the book will enable photographers working in a whole range of different genres to get the best out of their equipment while remaining in full control at all stages. No previous experience is assumed and the book is designed to be used with both Photoshop and Lightroom applications and generic inkjet printer software. Recent advances in colour management tools and inkjet printers have enabled photographers to get amazing, predictable looking prints. This book shows them how to go about the crucial process of colour managing their workflow. With no-nonsense instructions for setting up your camera, monitor, scanner, software and printer, it is both a handy reference work and a creative companion. Highlighting the answers to the most frequently asked questions, Tim Daly offers clear, jargon-free advice on all stages of image capture, scanning, processing and print out. He shows how to use a range of tools for effective troubleshooting when things go wrong, how to handle both simple and complex projects and how to understand the limitations of each process and combine them effectively. Illustrated throughout with the author's own stunning photographs, this book will enable photographers to get the best out of their equipment while remaining in full control at every stage. It assumes no prior knowledge and is designed for use with all recent versions of Photoshop and generic inkjet printer software. Alongside the digital photography revolution, a new form of photographic printing has emerged. 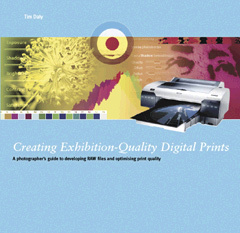 Digital printing, using desktop inkjet printers, has now replaced the traditional darkroom for many photographers. In the last two years, new advances in print quality have made inkjet prints indistinguishable from conventional photographs. For the very first time, photographs can share the hand-made qualities of fine art print. 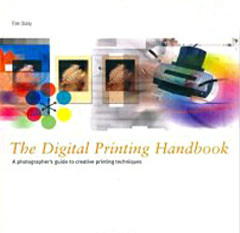 The Digital Printing handbook is a darkroom manual for this new digital age. 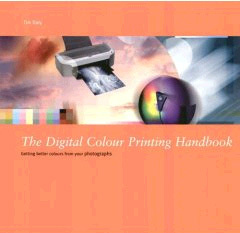 It provides clear and uncomplicated instructions for setting up your workstation and jargon-free advice on using all types of printers, papers and inks, including an exciting range of colour recipes for recreating darkroom and vintage print processes. Both simple and complex processes are explained with equal clarity and are supported by a comprehensive reference section. Each technique is simplified to work with all recent versions of Adobe Photoshop and the easy-to-follow steps assume little prior knowledge of the subject. Illustrated throughout with the author's own stunning photographs, The Digital Printing Handbook takes the reader into a new era of creative techniques. This is a well presented and printed book and does justice to its content. As an experienced photographer I was looking for ways for maximise my printing having 'converted' to digital. I was particularly interested in black and white printing. This book gives advice on lots of interesting techniques for high quality printing, including ' infra red', split toning, sepia etc. Easy explanation for dots per inch versus printer resolutions is given. My constant reference and well worth the money. A textbook and a coffee table book in one. Great read.